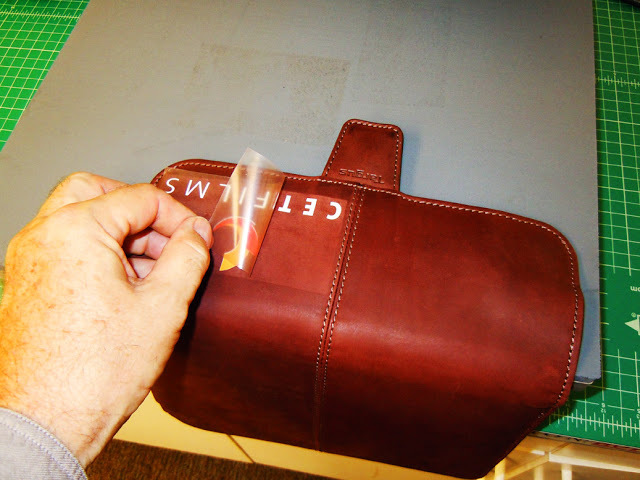 Discover which SEF heat transfer film to use when decorating leather. Avoid problems which could cost loss of time and materials, when making appliques. Back when Marlon Brando rode into Hollywood stardom in the Wild One (1953), the leather motorcycle jacket, adorned with a biker back patch, symbolized the country’s rugged iconoclastic spirit. Since the era of Brando, the popularity of real leather apparel has not diminished. Little has also changed in how we embellish leather attire. Leather jackets and vests are still decorated with sewn-on embroidered cloth patches with club names and the complimentary adornment of skulls, eagles and dragons. As an alternative to the embroidered patch, many shop owners have tried heat pressing appliques with varied results. In our tests at RTape, the problem is not getting a heat transfer material to adhere to the leather. Everything we have tried has bonded exceptionally well. Rather, the challenge is minimizing the effects of heat and pressure on the coloration and surface texture of the leather. Failure to control the process could get ugly. Just imagine the menacing visage of an enraged biker named Scum or Bone, after defacing his prized motorcycle jacket. In evaluating various heat transfer materials and application processes, we noted that the discoloration of leather is much more apparent with lighter colors. In the photo below, we have heat pressed our Tatoo printable polyurethane film at a temperature of 330 degrees F for 17 seconds. The printed graphic was masked with RTape Hot Mask. Note that the area not protected by the Hot Mask transfer tape has darkened. The rectangular shape of the heat mask was permanently impressed in the surface of the leather. On a darker brown leather, we achieved much more favorable results, when we applied our FlexCut Sticky LT at a lower temperature. The heat activated adhesive coated on this film is designed for nylon, other coated fabrics and difficult to adhere to surfaces. Because leather is tanned using many different types of natural materials, such as tannins, chemicals or vegetable or animal oils, any one of these treatments could affect adhesion. Being the most aggressive adhesive, we felt that this product was a safe choice for leather. As the saying goes, better safe than sorry. Note: There are many different types of leathers, as well as many different textures, treatments, and chemicals used in its processing. While heat transfer films, such as our FlexCut Sticky LT, can work great on many leather products, on other leathers nothing works at all. When feasible, it is always best to test and evaluate a film for a particular application. As I regularly remind people, “Test, Don’t Guess”. 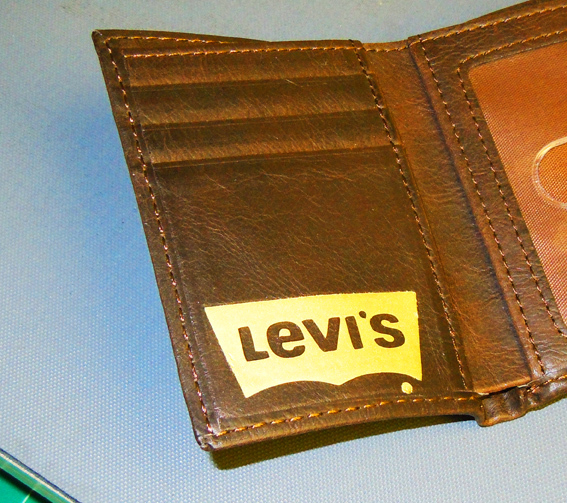 The gold FlexCut Sticky Nylon Levi’s applique (shown below) was heat pressed at a temperature of 240 degrees F for 17 seconds. Make no mistake, we still experienced some darkening of the leather, but to a much lesser degree. Covering the entire leather piece with a Teflon sheet or brown kraft paper may lessen any detrimental effects. Leather is a very soft and malleable, natural material. If you heat press an applique onto it, you can leave an impression of the carrier or Hot Mask transfer film in the leather itself. To minimize the impression of the polyester carrier in the leather, we trimmed much of the excess film around the perimeter of the graphic. Even after trimming, you will undoubtedly leave an impression in the leather, but it will likely be less aesthetically objectionable. A final option is to use a pressure-sensitive polyurethane film. The SEF product line includes its CoolFlex films for plotter cutting and the CoolPrint films for print and cut applications (shown in the photo below). These products are coated with a highly aggressive adhesive that will stick to just about anything. Not only does the adhesive exhibit very high initial tack, after application the adhesion continues to grow, doubling in peel value every 24 hours until ultimate adhesion is attained. CoolFlex and CoolPrint were designed for applications for objects that you cannot heat press, such as umbrellas, backpacks and cooler bags. That way you don’t risk high heat damaging the leather. And you keep your biker customers, like Scum and Bone, smiling.